The 88 metre Perini Navi superyacht Maltese Falcon has been spotted cruising around the Eastern Mediterranean. Pictured above in Rhodes on November 8, she has since sailed to Symi, Fethiye in Turkey, Kea and Perama, where she moored up on November 13. In recent months, she has also been spotted in the Ionian Islands, Monaco, Palma and the Maddalena Archipelago. Delivered in 2006, her highlights on board include spa facilities, a fully-equipped superyacht gym and an al fresco cinema. The 88 metre Perini Navi superyacht Maltese Falcon has been spotted cruising around the Eastern Mediterranean. Pictured above in Rhodes on November 8, she has since sailed to Symi, Fethiye in Turkey, Kea and Perama, where she moored up on November 13. In recent months, she has also been spotted in the Ionian Islands, Monaco, Palma and the Maddalena Archipelago. Delivered in 2006, her highlights on board include spa facilities, a fully-equipped superyacht gym and an al fresco cinema. 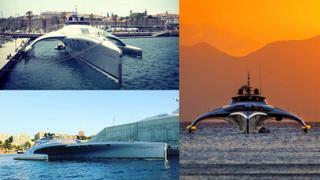 After departing from Palma on September 30, the extraordinary trimaran Adastra arrived in Port Adriano, Spain, on October 11 (pictured above, bottom left). She has also been spotted recently off Santorini (right) and in Marina de Cascais (top left). Leaving Gibraltar on November 11, it is thought that she is now on route to the Panama Canal. Delivered in 2012 by McConaghy Boats, the 42.5 metre multihull yacht boasts a spacious and contemporary interior with plenty of natural light. Her compact yet elegant exterior deck opens straight out to the water and features an al fresco dining table and a large comfy sofa. After departing from Palma on September 30, the extraordinary trimaran Adastra arrived in Port Adriano, Spain, on October 11 (pictured above, bottom left). She has also been spotted recently off Santorini (right) and in Marina de Cascais (top left). Leaving Gibraltar on November 11, it is thought that she is now on route to the Panama Canal. Delivered in 2012 by McConaghy Boats, the 42.5 metre multihull yacht boasts a spacious and contemporary interior with plenty of natural light. Her compact yet elegant exterior deck opens straight out to the water and features an al fresco dining table and a large comfy sofa. While on his own superyacht vacation in the Med on board a Leopard 32, world-famous MMA fighter Conor McGregor went yachtspotting in Mallorca on September 12 and stumbled across 142.81 metre Sailing Yacht A, which has been spending the summer cruising around the Mediterranean and arrived in Limassol, Cyprus, on October 20. Delivered by Nobiskrug in 2017, the Philippe Stark-designed Sailing Yacht A has been one of the most talked about and divisive superyachts of the year so far. Famed for her distinctive design and extraordinary sails, much of her interior remains shrouded in secrecy. She has also been spotted in Ibiza, Spain, La Spezia, Formentera and a number of other popular Med hotspots. Conor McGregor is currently taking some time off after his fight with boxer Floyd Mayweather on August 26. He has also been spotted partying with friends in Ibiza. While on his own superyacht vacation in the Med on board a Leopard 32, world-famous MMA fighter Conor McGregor went yachtspotting in Mallorca on September 12 and stumbled across 142.81 metre Sailing Yacht A, which has been spending the summer cruising around the Mediterranean and arrived in Limassol, Cyprus, on October 20. Delivered by Nobiskrug in 2017, the Philippe Stark-designed Sailing Yacht A has been one of the most talked about and divisive superyachts of the year so far. Famed for her distinctive design and extraordinary sails, much of her interior remains shrouded in secrecy. She has also been spotted in Ibiza, Spain, La Spezia, Formentera and a number of other popular Med hotspots. Conor McGregor is currently taking some time off after his fight with boxer Floyd Mayweather on August 26. He has also been spotted partying with friends in Ibiza. The 85.1 metre superyacht Solandge was spotted in Puerto Banús in early September alongside 53.54 metre Mia Rama. Solandge has since been sighted in Genova, Antibes and Valetta, and Mia Rama has been cruising around Greece. Delivered by Lürssen in 2013, Solandge has also been spotted recently in Gibraltar, Zadar, Croatia, Porto Cervo and Malta. In October she continued her Mediterranean adventure and made her way from Antibes to Valletta in Malta, where she is currently moored. Mia Rama was delivered in 2010 by Golden Yachts, and has also been sighted in Gibraltar in recent months. She was also spotted in Antibes at the end of September before making her way to Greece earlier this month. The 85.1 metre superyacht Solandge was spotted in Puerto Banús in early September alongside 53.54 metre Mia Rama. Solandge has since been sighted in Genova, Antibes and Valetta, and Mia Rama has been cruising around Greece. Delivered by Lürssen in 2013, Solandge has also been spotted recently in Gibraltar, Zadar, Croatia, Porto Cervo and Malta. In October she continued her Mediterranean adventure and made her way from Antibes to Valletta in Malta, where she is currently moored. Mia Rama was delivered in 2010 by Golden Yachts, and has also been sighted in Gibraltar in recent months. She was also spotted in Antibes at the end of September before making her way to Greece earlier this month. After being delivered to her owner in Norway last month, 123 metre Al Lusail has been making her way to the Mediterranean, making stops in the Solent off Portsmouth in England (pictured top right, August 26), Gibraltar (August 28), Tarragona in Spain (bottom right, August 31) and Genoa in Italy (left, September 3). She is currently moored in Tarragona. She boasts March & White interiors as well as naval architecture and exteriors by H2 Yacht Design. It is thought that the Lürssen superyacht will now head to Porto Cervo from Genoa. 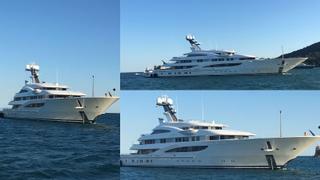 After being delivered to her owner in Norway last month, 123 metre Al Lusail has been making her way to the Mediterranean, making stops in the Solent off Portsmouth in England (pictured top right, August 26), Gibraltar (August 28), Tarragona in Spain (bottom right, August 31) and Genoa in Italy (left, September 3). She is currently moored in Tarragona. She boasts March & White interiors as well as naval architecture and exteriors by H2 Yacht Design. It is thought that the Lürssen superyacht will now head to Porto Cervo from Genoa. After cruising from Antibes to the Gulf de St Tropez on August 21, the 69.15 metre support vessel Game Changer was spotted moored up alongside 85.1 metre Solandge and 77 metre Silver Fast. She has since been spotted in Gibraltar and arrived in Barbados on November 8. Delivered by Damen earlier this year, Game Changer made her London debut in May, mooring up alongside the museum ship HMS Belfast. She has also been spotted in Sardinia, Ibiza and the Netherlands. Built on speculation and currently offered for sale, she boasts 250 square metres of open deck space for storing tenders, a certified helipad, a spacious mess area for a crew of up to 22 and a superyacht gym. After cruising from Antibes to the Gulf de St Tropez on August 21, the 69.15 metre support vessel Game Changer was spotted moored up alongside 85.1 metre Solandge and 77 metre Silver Fast. She has since been spotted in Gibraltar and arrived in Barbados on November 8. Delivered by Damen earlier this year, Game Changer made her London debut in May, mooring up alongside the museum ship HMS Belfast. She has also been spotted in Sardinia, Ibiza and the Netherlands. Built on speculation and currently offered for sale, she boasts 250 square metres of open deck space for storing tenders, a certified helipad, a spacious mess area for a crew of up to 22 and a superyacht gym. On August 22 the striking outline of 85 metre superyacht Areti was spotted in the bay of Porto Venere, Italy, having been moored up off Nice the day before. She arrived in Miami on October 29 and is now on route to the Bahamas. Delivered at the end of July by Lürssen, Areti is spending the summer cruising around the Mediterranean before making an appearance at the Monaco Yacht Show. Her interior and exterior design was created by British studio Winch Design, and she can accommodate up to 18 guests in nine cabins. On August 22 the striking outline of 85 metre superyacht Areti was spotted in the bay of Porto Venere, Italy, having been moored up off Nice the day before. She arrived in Miami on October 29 and is now on route to the Bahamas. Delivered at the end of July by Lürssen, Areti is spending the summer cruising around the Mediterranean before making an appearance at the Monaco Yacht Show. Her interior and exterior design was created by British studio Winch Design, and she can accommodate up to 18 guests in nine cabins.